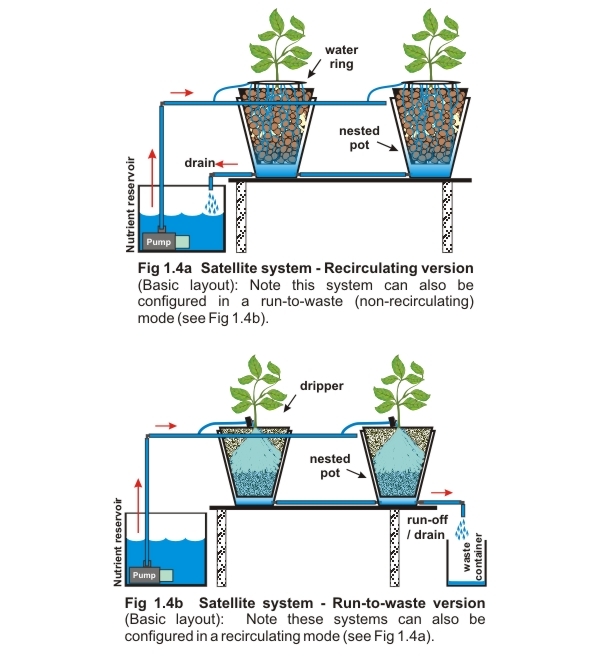 These are systems where multiple independent pots are connected to a central nutrient reservoir. It is plumbed in either a ‘recirculating’ (Fig 1.4a) or ‘run-to-waste’ mode (Fig 1.4b) depending upon which medium is used. However, it is undesirable to have run-to-waste specific media (e.g. soil, coco fibre, Rockwool) in some pots and recirculating specific media (e.g. expanded clay, perlite) in others. This is because of the different feed frequencies and volumes required for each. Individual pots are top fed and contain multiple drain holes in their base to ensure complete drainage. Each pot is seated inside a second pot that acts as a sump to collect the waste nutrient. This arrangement is referred to as a “nested” pot. The ‘sump’ pot contains a drainage line that is either plumbed to waste (Fig 1.4b), or back to the central nutrient reservoir (Fig 1.4a). ● Very flexible because pots can be added or removed as needed without disturbing the other pots. ● Larger pots can be used for plant species with large root systems. ● Easy to reposition individual plants. ● Diseased or pest ridden pots can be removed to protect healthy pots. 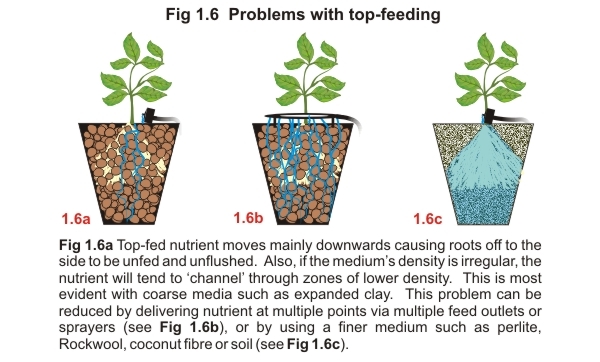 ● Top-fed nutrient tends to ‘channel’ downward through the medium where root density is lowest. As a consequence, roots located off to the side often dry out (Fig 1.6).